Yesterday, I found myself in need of a TIFF image splitter. Reason: The scanner in my office didn’t allow me to retain the settings after a document scan. So every time I choose to ‘End Scanning’, the output image quality setting is reset to default. Which means I need change the output settings for each of document that I want to scan. The only way was to scan all documents at one go. That lead me to the situation where a TIFF splitter is needed. 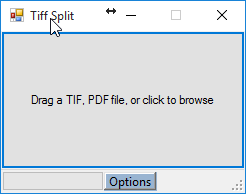 A quick Google-search brought me to a simple, free and open-source program called Tiff Splitter. It is exactly the kind of program that I need. It is simple, and does its job well. Because it does the job well, I become interested to find out how exactly Tiff Splitter works. Since it’s an open-source, I can immediately take a dive and learn. After we click, select an input file, or, drop a file, the event handlers will eventually call processFile method. Hmm, it looks simple. But who is _coder? How does it able to distinguish PDF, TIFF or JPG? Different format definitely requires different treatment right (or so I thought) ? The secret is in Prepare and CoderFactory method. // .. Snipped: Validate input file ..